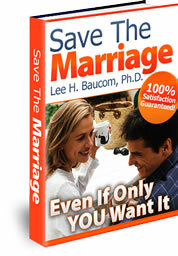 Lee Baucom Ph.D. is the Creator of The Highly Successful Save The Marriage System. He is a 2 decade veteran of marriage therapy. His training has been in marriage and family therapy, earning two Master’s Degrees and a Ph.D. in the area. Lee has also completed specialty training in Community Building, as well as in Personal and Life Coaching. Dr Baucom is an experienced facilitator of health and healing for individuals, couples, families, and organizations. This experience has given Lee Baucom a different perspective on why couples have problems, and what the solutions are for these problems. From the beginning, Baucom was committed to making relationships work. It is his contention that most relationships are salvageable, and that many take the “easy way out,” rather than finding a workable solution that preserves the relationship, leaving the relationship healthy and individuals happy. 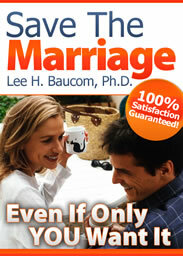 Dr Lee Baucom has been happily married for 22 years, and has two children. He is devoted to his family, and sees that as inspiration for his own work with families trying to find health. He enjoys trail running, mountain biking, scuba diving and pursues flyfishing and is an avid reader. “Firstly, I want to thank you on your great help you provided in your book. My wife already filed for divorce before I downloaded you book, and i wanted to do anything I could to save what I could. At that stage I stumbled onto your website, and normally I don’t buy e-books over the internet. We were speaking, but obviously the relationship was very tense. After reading your book I realized what could have gone wrong. I changed my perspective on my marriage, and after only about 1 week, she has delayed the proceedings, and is seriously reconsidering the divorce completely. She is also starting to commit to this marriage. If this can happen in my marriage in only 1 week, i can only imagine what it van mean to others. It was worth every penny.